My HR Hub is speaking at the HR Essentials for Line Managers workshop hosted by D2N2 Growth Hub and Oxford Innovation. 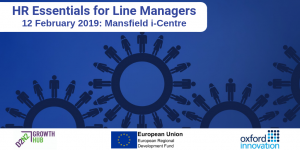 In this free event, taking place on the 12th February 2019 at the Mansfield i-Centre, My HR Hub will be discussing the HR essentials for businesses, including interviewing skills and managing a remote sales team. This workshop is aimed at SMEs, sole traders and business owners in Derbyshire and Nottinghamshire.